The Bureau of Labor Statistics reports that the demand for chefs and head cooks at restaurants and other establishments will grow 9%, faster than most other industries in the country. With the popularity of cooking shows and competitions, more and more people are discovering the field of culinary arts and what it takes to be successful in the industry. Earning a certificate or degree in the field not only provides the experience and training needed to get your foot in the door, it also provides a foundation for upward mobility to become future leaders and trend setters in the industry. We looked at culinary schools across the United States to develop a list of what we believe to be the 50 best culinary schools or programs in the nation. From our initial list, we looked for schools that offer hands-on experience, internship/externship opportunities, student operated restaurants, modern facilities, and a solid reputation in the industry. 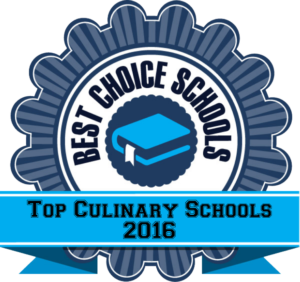 We only looked at schools that were nationally accredited or accredited by the American Culinary Federation. We came up with our list of the 50 Best Programs and ranked them based on the information we reviewed and our overall impression of the school, information from College Navigator, internet reviews, and the school website. All of these schools offer quality programs which can help students be successful in the field of culinary arts. The New England Culinary Institute in Vermont offers a wide array of culinary degrees both in the traditional classroom environment and online. The culinary arts programs include residency requirements and internships of varying lengths, depending on the degree. The AOS degree can be completed in just two years and the BA degree in just over three years. Students begin working in the kitchen as soon as they start the program to get familiar with concepts and techniques immediately. Multiple internship requirements allow students to get a taste of different types of settings. NECI offers holistic programs which focus on the skills culinary experts need to be successful. Columbus Culinary Institute at Bradford School offers two programs for professionals who want to pursue a career in the culinary arts. The Culinary Arts Diploma program is a 12 month program offering a variety of courses such as fish and shellfish arts and soups, starches, and sauces. The Associate of Applied Science in Culinary Arts is an 18 month program that includes coursework and an eight week externship opportunity. Students spend three hours a day in kitchen instruction in both of these hands-on programs. CCI instructors are trained in both classical and modern cooking methods and techniques so students can feel confident that their training is relevant to the needs of the modern kitchen. Cascade Culinary Institute at Central Oregon Community College offers students the opportunity to work in a state-of-the-art kitchen facility while they learn their craft. The Jungers Culinary Center has cooking labs and a demonstration theater so students have the opportunity to learn in a cutting edge environment. Elevation Restaurant is a student operated restaurant allowing students to cook and serve in a real restaurant environment. Students can complete an internship as part of the associate degree program which can be completed in seven terms. Elective coursework covers specialty areas such as farm to table, sustainable cuisine practices, and nutritional therapy. Faulkner State Community College offers several different certificate and degree programs for students who want to pursue a career in the culinary arts. The AAS programs in Baking and Pastry as well as the AAS in Culinary Arts are two year programs that include an apprenticeship opportunity. Students complete a capstone course where they prepare a meal and submit it for judging and review by program faculty. Students have the opportunity to showcase their creativity in the culinary arts through courses such as Culinary Art Sculpture, Into to Garde Manger, and Plated Dessert Design. Pastry students participate on competition teams to showcase their talent. The AAS degree programs can be completed in two years of study and prepare graduates for management level positions. The Lincoln Culinary Institute at Lincoln Technical College offers both a 77 week AAS program and a 51 week certificate program in the culinary arts. Over 80% of students finish the program in the recommended time frame and the job placement rate is about 80%. Classes are taught by experienced chefs trained in the latest cooking methods such as SousVide and thermal immersion. Students in the program work in the student-run restaurant, Café Protégé. This experience provides hands-on training and experience working in an actual restaurant from hostess to chef. The accredited culinary programs at Jefferson State Community College offer students the choice of various AAS and certificate options making it easy to find the best fit. Students gain hands-on experience by working in the bistro ProVare “classroom café” throughout the program. The Culinary Club provides the opportunity for students to network and socialize with other like-minded students. Students who elect to complete one of the AAS programs have the opportunity to earn their certificate along the way. Sullivan University National Center for Hospitality Studies is a top ranked culinary school given an “exemplary” rating by the American Culinary Federation. Students can complete their associate’s degree in just 18 months of study that includes a practicum or externship. As a testament to the quality of the education that students receive, students on the culinary competition team have brought home over 400 medals from various competitions around the globe. Graduates have gone on to work as chefs, nutritionists, food scientists, and caterers in setting such as hospitals, cruise ships, restaurants, and schools. The Culinary Arts and the Baking and Pastry Arts programs at Sullivan University’s National Center for Hospitality Studies are accredited by the American Culinary Federation’s Accrediting Commission. For more information about our graduation rates, the median debt of students who completed the program, and other important information, please visit our website at, http://pages.sullivan.edu/programsuccess/. As the premier cooking school in Hawaii, Kapiolani Community College has an accredited culinary arts program offering both associate level degrees as well as certificates. Kapiolani Community College features “Slow Food KCC,” a campus run organization emphasizing the importance of appreciating where food comes from and “counteracts fast food and fast life.” Students can work in several different dining facilities on campus that service as “learning labs,” offering a variety of different foods and dining experiences. Ka’lkena Laua’e is one such restaurant, allowing students to demonstrate their skills in a fine dining environment. The associates degree programs offer an internship opportunity and can be completed in about two years of study. Indian Hills Community College is a top culinary school offering students the opportunity to learn in a state-of-the-art environment with extensive hands on experience. Almost half of each day is spent in the kitchen. The program offers a wide variety of courses so students can learn management skills in addition to their culinary training. Courses include Culinary Computer Apps, Principles of Management, and Into to Economics. The associate’s degree program can be completed in just 21 months of study and includes an internship experience. Columbus State Community College offers an Associate in Applied Science in Hospitality Management with several different program tracks. Students can complete their associate’s degree in two years of full time study and can attend classes during the day or in the evening. The program covers courses in business, hospitality, nutrition, and foods. Students complete a work experience as part of the program to become more familiar with working in an actual restaurant. Throughout the course of the program, students work at Christopher’s, a student run restaurant open to the public. Students who pursue the Culinary Apprenticeship major complete on-the-job training requirements set forth by the National Apprenticeship Training Program of the American Culinary Federation. The culinary arts programs at Westmoreland County Community College are available with an apprentice option and a non-apprentice option. Students who pursue the apprenticeship option complete about 64 credit hours of coursework and 4,000 hours of on-the-job training. The apprenticeship option in the Baking and Pastry program partners with Nemacolin Woodlands Resort in the “Earn While You Learn” program where students can work while earning their degree. Students can complete the program in about two years. The non-apprenticeship option is a blend of coursework and an internship. Westmoreland offers ACF accredited programs, state of the art facilities and experienced faculty. El Centro College in Dallas, Texas is located in the ideal setting for chefs and other culinary professionals. Several conference centers, hotels, and restaurants are located nearby, providing an excellent opportunity for employment and training. The culinary programs at El Centro are accredited by the American Culinary Federation. Students receive hands-on training throughout the program and are taught by experienced professionals in the field. Students have the opportunity to join the Culinary Students Association and participate in culinary competitions. El Centro offers a “Fast Track Program in Culinary Arts” for students who want to work through the program in a cohort and complete a guaranteed path to their associate’s degree. When students at St. Philip’s College want a fine dining experience, they head to Artemisia’s, the student restaurant where students prepare and serve a variety of international and domestic entrees, salads, and desserts. San Antonio has a booming tourism industry which offers employment opportunities in the culinary and tourism industry. Students in the associate degree programs complete a practicum to gain professional experience. Associate degree programs can be completed in two years. Certificate programs, including the Baking Principles Certificate, also include a practicum and can be completed in three semesters. Pikes Peak Community College has a multitude of associate degree concentrations and certificate programs to meet the needs of those looking to enter the field of culinary arts. This top culinary school requires students to complete an internship program as part of their training to gain hands-on experience necessary to be successful in their career. Students receive appropriate training and education to pursue positions such as chef, head cook, or food service manager. Certificate programs are offered for students who need immediate skills in culinary arts. The programs offer hands-on experience and professional training to allow them to obtain or continue employment in their specialized field. Manchester Community College has the only AFS accredited culinary arts and hospitality management programs with Exemplary Status in New England. This top culinary school offers both associate degree programs and certifications which are specialized to meet the needs of culinary professionals at all levels. MCC offers affordable tuition and students pay course-by-course instead of one entire program fee. Students are required to complete an internship as part of the associate’s degree and certificate programs which consist of both a paid and unpaid component. As graduates of MCC, students receive assistance with job placement and other career services throughout their professional culinary careers. Delaware Technical Community College is a top culinary school offering a diverse experience to students who want to become pastry chefs, bakers, chefs, food service managers, kitchen managers, and line cooks. The associate degree programs are accredited by the American Culinary Foundation. Students complete a field experience prior to graduation so they are prepared for the workforce and can effectively demonstrate their skills and abilities. The curriculum is set up to encourage diversity, team work, and leadership skills necessary to succeed. As one of the top culinary schools in the country, Florida State College at Jacksonville offers an accredited AA in Culinary Management awarded Exemplary Status by the American Culinary Federation. Students have the opportunity to learn in a hands-on environment which includes the student operated, five star restaurant, Mallard Room. Students complete an internship experience as part of the AA program where they can learn different skills and techniques outside the classroom. The Certificate programs offer basic level instruction and build a solid foundation for students to get started in the field. Graduates of the AA program are well prepared to work as chefs or line cooks in a variety of culinary settings. The International Culinary School at the Art Institute of Fort Lauderdale is part of a network of about 50 art institutes around the country. Students in Fort Lauderdale have the opportunity to earn either a diploma or an associate’s degree in either culinary arts or baking and pastry. Students can complete the associate’s degree program in 6-11 week quarters. Students have the opportunity to gain valuable hands-on experience in the student run restaurant. Chef’s Palette Café. In 2005, the Art Institute of Fort Lauderdale won an American Culinary Federation Achievement of Excellence Award. Graduates of the program are prepared to work as entry level cooks or chefs in a variety of settings. The Culinary Institute of Savannah at Savannah Technical College offers a top culinary program for experienced professionals as well as those just getting their career off the ground. The AAT programs in Culinary Arts or Culinary Baking and Pastry Arts are hands-on programs requiring an extensive amount of time in the kitchen. Students learn international techniques as well as those familiar to Americans. Diploma programs also require a practicum, a testament to the emphasis STC places on the importance of a hands-on education. The International Culinary School at the Art Institute of Atlanta offers a variety of culinary arts programs. The Culinary Arts Management bachelor’s program blends culinary skills and management to develop knowledgeable leaders who can work in a variety of positions such as kitchen managers, banquet chefs, and purchasing managers. The associate degree programs are taught by culinary experts and students have the opportunity to demonstrate their skills in the student run “dining lab” on campus. Creations Restaurant is open to the public and allows students to work (with faculty supervision) to learn everything from guest seating and hospitality to cooking. For students just getting their feet wet, diploma programs are available to learn hands-on skills in baking and culinary arts. Secchia Institute for Culinary Education has offered ACF accredited culinary programs for more than 30 years. Secchia has over 32 different instructional spaces which include kitchens, bakeshops, classrooms, demonstration theater, and a culinary amphitheater. Secchia also has a wine and food library. Students can expect to receive hands-on training throughout the program in addition to lecture courses to ensure a well-rounded experience. Students have the opportunity to practice and demonstrate their skills under the supervision of faculty at three different types of restaurants on campus including a deli/bakery, a fine dining restaurant, and a conference center. Secchia has been recognized by the National Restaurant Association/American Vocational Association, and the ACF Accrediting Commission. The University of Hawaii Maui College offers a unique tiered career ladder system beginning with the Certificate of Competence program in either Culinary Arts (19 credits) or Pastry (20 credits). Students can stop there or move to the Certificate of Achievement program in Culinary Arts which is a 31 credit program and includes some general education courses. The associate degree programs are accredited by the ACF and prepare students for leadership positions in the culinary field. The foundation for all culinary programs at the University of Hawaii Maui College is to be able to prepare, purchase, and serve professional food items in a sanitary and organized environment. Johnson County Community College offers highly selective culinary programs for students pursuing a career in the culinary arts. The exclusive three-year Chef Apprentice Program is sponsored by the American Culinary Federation and includes coursework and experiences in management, accounting, menu planning, and purchasing. The 68 credit hour AAS in Food and Beverage Management includes an internship and can be either a terminal degree or students can transfer to a four year program. Each year, only 15 students are admitted to the exclusive two-semester Pastry/Baking program. Students work in the college pastry shop and learn to work both as a team and as an individual. The Dietary Manager Certificate prepares students for the dietary manager exam. Students complete a practicum and field experience as part of this program. The San Diego Culinary Institute offers two unique professional diploma programs that students can pursue either full or part-time. The Commis Method teaches students how to become a chef and over 80% of the program takes place in the kitchen. Unlike simply following a recipe, students learn techniques and understand the “why” behind different ingredients and flavors. Part of the program includes courses in business and professionalism so students are able to graduate with the skills needed to lead and be successful. Diploma programs can be completed in eight to 11 months. As a top culinary school, San Diego Culinary Institute offers career planning services to students and alumni in addition to top notch externship sites so graduates are always a set ahead of the competition. Arizona Culinary Institute is a top accredited culinary school with a 90% job placement rate over the past five years. Students spend about 80% of their time in the kitchen. Students work in small group settings with a student-faculty ratio of about 20:1. Most students can complete their diploma in just eight months of study. As part of the program, students complete a paid internship to gain additional practical experience. ACI is an industry specific institution and only offers training and coursework specifically relevant to a career in culinary arts, baking or restaurant management. Undoubtedly, Johnson and Wales University is one of the top culinary schools in the country, if not the world. Johnson and Wales has been around for over 100 years and has been recognized by US News and World Report, Money, and The President’s Higher Education Community Service Honor Roll. With campuses in four different states, Johnson and Wales has over 100,000 alumni from around the world. Hands-on learning is a part of the program and students receive plenty of individualized attention with a 18:1 student-faculty ratio. Students graduate with the skills and knowledge to be lifelong learners and be successful in their culinary career. Trenholm State Technical College offers the largest ACF accredited culinary arts program in Alabama. Associate degree programs include an apprenticeship opportunity that students complete in their final two semesters. Students can complete their degree in just six semesters or 76 credit hours. Students have time to develop their culinary skills by spending time in food preparation labs. Coursework covers topics such as nutrition, table service, sanitation, and cost control. Arkansas Culinary School at Pulaski Technical College has the only ACF accredited culinary programs in the state. Students can work toward a variety of certificates and two different AAS degrees depending on their professional and personal interests. Students in the AAS programs complete an internship and electives related to their specialization. The apprenticeship program requires coursework as well as 4,000 on-the-job-training hours. When apprenticeship students complete their program requirements, they are awarded Certified Sous Chef status, a certification from the ACF. The Institute of Technology is a top culinary school recognized by the ACF, offering quality culinary and baking programs to students who want to jump start their career. The Baking and Pastry Specialist program is a 47.5 credit hour program lasting about 40 weeks and includes an immersion experience in a full service kitchen. The Culinary Arts Specialist program includes a 180 hour externship opportunity and offers specialized training in Garde Manger, contemporary and international cuisine preparation, and pastry and baked goods. The AOS degree program is considered an Exemplary program by the ACF, offering an externship opportunity, hands-on training, and coursework in advanced culinary skills. Graduates of the AOS program are prepared to work as a cook, chef, baker, or catering specialist. The Culinary Program at Los Angeles Trade-Tech school is the oldest culinary program in continuous operation in the United States. This top culinary school is accredited by the AFC. The associate degree programs can be completed in just four semesters of study and students may begin the program at the start of any semester. Students get plenty of hands-on experience in state-of-the-art labs and work experience. LATT offers job placement assistance and guidance with resume writing and interviewing skills. The culinary arts program at Hillsborough Community College offers four different associate degree programs and five certificate programs. Students can attend either part time or full time as they earn their certificate or degree. The kitchen labs are state-of-the-art with modern cooking equipment. HCC keeps up with the latest in culinary technology and revamps the program every year to keep up with the latest trends in the industry. Students have the opportunity to gain hands on experience at The Gourmet Room, a fine dining establishment run by students in the culinary and hospitality program. The AS in Culinary Arts degree program at Keiser University is accredited by the American Culinary Foundation and has been recognized by the World Association of Chef Societies. This top culinary school offers courses in American and international cuisine as well as specialty areas such as pastry and desserts. Students complete a 12 credit hour externship at the end of the program. Graduates are well prepared for entry level positions in the culinary field and are an asset to hotels, restaurants, and cruise ships. Ivy Tech Community College offers a top ACF accredited culinary program with an extensive offering of certificate and culinary degree programs. Associate degree programs can be completed in just two years while certificate programs take between a year and a year-and-a-half. The full time 60 credit hour AAS in Baking and Pastry requires a co-op/internship experience and includes specialty electives such as Wedding Cake Production and Plated Desserts. The AAS in Culinary Arts also requires a co-op/internship experience so students gain additional professional experience before starting their careers. Students perfect their culinary or pastry skills and techniques in a state-of-the-art educational kitchen. Culinary students interested in a top accredited culinary school with a variety of professional development experiences should consider Kirkwood Community College. KCC offers an AAS degree in Culinary Arts that can be completed in two years and requires extensive hands-on experience. Students practice their skills at The Class Act Restaurant located in The Hotel at Kirkwood Center during their final semester. Students interested in international cuisine have the opportunity for international travel to experience the culinary environment first hand. Field trips are a regular part of the program, allowing students to see a variety of settings and styles. Delgado Community College offers three different AAS programs for those who want to pursue a career as a chef, pastry artist or catering professional. Students are prepared for entry to mid-level positions in the culinary industry. The Chef Apprenticeship program allows students to study under some of the best chefs in New Orleans. Catering students learn how to set up both on and offsite catering. Pastry Arts students are prepared to work in pastry shops, hotels, and private bakeries. All programs and certificates require plenty of hands-on experience build upon a solid foundation of fundamentals in the field. Students at the Hotel, Culinary Arts and Tourism Institute at the Anne Arundel Community College learn from the best in the business. Faculty and staff are trained in the latest methods and techniques. This top culinary school offers three different AAS degree options which all include a practicum experience. The AAS Culinary Option is accredited by the ACF and the Hospitality Business Management program is accredited by the Accrediting Commission for Programs in Hospitality Administration (ACPHA). Graduates are prepared to work as bakers, cooks, manager-in-training, and pastry cook. The L’Academie de Cuisine is a top culinary school founded in 1976 out of the need to offer top quality training and education to culinary professionals. The program has received national recognition over the years and is well respected in the Washington DC area and around the country. The culinary arts program includes a 26 week paid apprenticeship so students really get a chance to experience a fully functioning kitchen and gain professional industry experience. The pastry arts program also offers a 26 week paid apprenticeship where students work in a restaurant, hotel, or bakery to master their skills. Students benefit from small class size and experienced faculty who know what it takes to be successful in this competitive industry. The ACF accredited AAS in Culinary Arts from the Culinary Studies Institute at Oakland Community College is an extended degree program requiring students to complete 73 credit hours which includes a working internship. Students have the opportunity to complete in culinary competitions if they desire. Students interested in the Certificate in Baking and Pastry complete 32 credit hours with coursework covering areas such as retail baking, merchandising, cake decorating, and breads CSI operates three different culinary establishments where students work and learn their trade. Ridgewood Café has a fine dining component as well as a cafeteria and the Ridgewood Bakery serves a variety of baked goods. Reflections Restaurant is open September through April and serves three different entrees each Thursday. The Great Lakes Culinary Institute at Northwestern Michigan College offers a rigorous culinary program that focuses on the science and technique behind culinary practices. Students have the opportunity to work in five different culinary labs including a bakery, kitchen, advanced kitchen, a garde manger kitchen, and a beverage management outlet. Lobdell’s, a student operated restaurant, provides the opportunity to practice skills and obtain work experience. This top culinary school also offers a Level III Certificate of Achievement accredited by the ACF. The 54 credit hour program prepares graduates to become cooks in fine restaurants and other top establishments. Henry Ford College offers an accredited Bachelor of Science in Culinary Arts and Exemplary ACF accredited AAS degree program in Culinary Arts. Students learn in six state-of-the-art kitchen laboratories, a computer lab, and a video production studio. The BS degree builds upon the AAS degree by offering advanced coursework in business and management. The student run restaurant, Fifty-One O One is open during the school year and serves a wide variety of foods. The restaurant offers a weekly International Lunch Buffet for five weeks in May and June to allow students to practice their international culinary skills. The Associate in Applied Science from St. Louis Community College is a 64-credit hour program designed to teach a variety of skills in food preparation and management so graduates are prepared for upward mobility in the culinary arts. This top culinary school requires students to complete a capstone experience where they prepare and manage one meal through a commercial simulation. Coursework includes preparation of American as well as international Cuisine. The Metropolitan Community College offers an accredited Culinary Arts and Management program with degree programs and certificates to meet the needs of every level of culinary professional. The Culinary Arts and Management associate degree program offers three different options including culinary arts, baking and pastry, and culinary research/culinology transfer. Associate degree programs are made up of 27 credit hours of general electives and 35-40 credits in major requirements which includes an internship. Students complete a professional portfolio. Certificate programs are available in culinary arts and management, baking and pastry, culinary arts foundations, and ManageFirst. Certificates can be earned in approximately one year. Students work in kitchen laboratories and develop skills first hand while working side-by-side with experienced culinary professionals. The Culinary Arts Program at the College of Southern Nevada is an ACF accredited program offering both certificate and degree programs in culinary arts and pastry arts. Students have the opportunity to work in the on-campus Russell’s Restaurant, a full service dining facility where students can practice everything from food preparation to hospitality. Students who receive their associate’s degree can transfer to UNLV to earn their bachelor’s degree if they elect to do so. Students in both the certificate and associate degree program work next to award winning chefs in state-of-the-art kitchen facilities. The low student-faculty ratio at this top culinary school ensures that students have plenty of one-on-one attention throughout the program. The Culinary Arts Institute (CAI) at Hudson County Community College is one of only two programs in the state accredited by the ACF. This top culinary school takes great pride in offering students individualized instruction and interaction with faculty and staff. Kitchen labs only have 16 students working at a time. The CAI has several different kitchen labs which include bakeries, an ice-sculpting studio, fish and butchery room, a 4,000 volume library, and a mock hotel suite. Some of these labs have been featured on shows such as Cake Boss. Pierpont Community and Technical College is a top accredited culinary school offering both degree programs in the field of culinary arts. Students complete an internship as part of this ACF accredited program and learn how to prepare and deliver quality food in a variety of settings. Students who complete the Culinary Arts associate degree program can sit for the ACF exam to become a Certified Culinarian. Students have the opportunity to matriculate into the bachelor’s degree program in Hospitality Management if their focus is business and management driven. The Institute of Culinary Education is one of the best culinary schools in the country. 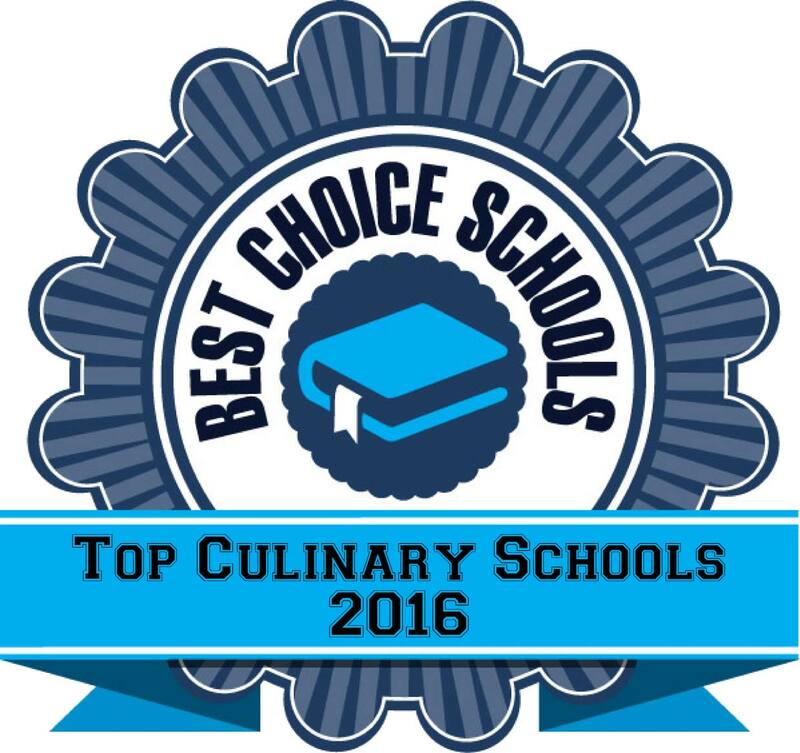 In 2016, the Institute of Culinary Education was named “Best Culinary School in America by The Daily Meal — a leading food and lifestyle website. The International Association of Culinary Professionals named ICE “Culinary School of the Year” four times in the last 13 years and the school has an excellent reputation in the industry. Overall student satisfaction is high with 93% of alumni recommending ICE to their peers who want to start a career in the culinary field. ICE is on the cutting edge of the latest trends in the culinary arts, and its facility includes a bean-to-bar Chocolate Laboratory and a Hydroponic Garden. During the course of the program, students are given the opportunity to participate in both paid and unpaid externships at some of the finest restaurants in the country. For students who don’t receive an employment offer from their externship opportunity, ICE offers career placement services including career fairs, networking opportunities and an alumni network of over 14,000 graduates. The Auguste Escoffier School of Culinary Arts teaches techniques developed by the world renowned “King of Chefs”, Auguste Escoffier. Students benefit from small class size and personalized attention throughout the program. The Auguste Escoffier School of Culinary Arts offers lifelong professional support to graduates through job placement assistance, use of facilities, resume development, and networking opportunities. One of the highlights of the culinary arts program is a three to 10 week (depending on the program) Farm to Table Experience which allows students to learn where a variety of foods come from, farming methods, and sustainability practices they can use throughout their career. Students may have the opportunity to experience produce, livestock, or dairy farms as well as the artisan market during their Farm to Table Experience. Students spend most of their time learning modern cooking techniques in a state-of-the-art test kitchen. This top culinary school also offers externship opportunities as part of each program for students to gain valuable handsn experience in a professional culinary setting. There is no doubt that the Culinary Institute of America is one of the best culinary schools in the country, if not the world. Almost 80% of students in an associate degree program at the CIA will graduate. Of those who continue on at the CIA to earn their bachelor’s degree, over 90% will graduate. The CIA offers degree programs in a variety of areas for those who want to excel in the area of culinary and party arts to those who want a career in management. Students spend about 1,300 hours in kitchens and bakeries as part of their study and have the opportunity to work with over 170 chefs from 19 different countries. In addition to traditional degree programs, the CIA offers the ProChef Certification Program which validates skills as chefs advance in their careers. The CIA offers students over 1,200 different externship sites which include some of the most exclusive restaurants in the country. With an alumni network of over 48,000 alumni, CIA graduates have the opportunity to network with other graduates who have gone on to be successful in the industry. The International Culinary Center in New York and California offers immersion style programs to allow students maximum opportunity for hands-on learning. ICC boasts a 91.5% graduation rate and over 15,000 students have graduated from the ICC including Bobby Flay and Christina Tosi. Diploma programs can typically be completed in six to 14 months of study and include hours onsite in addition to an externship. A small student- teacher ratio (often just 12:1!) ensures that students receive individualized attention they need to be successful in their program. What is the Employment Outlook for the Field of Culinary Arts? How Can I Find a Culinary Arts Internship? What is the American Culinary Federation?